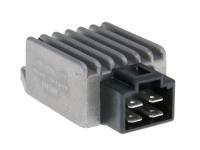 This regulator is similar to the NARAKU ignition coil. The controller reaches a significantly higher output than the standard controller by ensuring that the voltage from the alternator is appropriately transferred The charging voltage itself remains at the same level as in the original control between 12.6V and 14.75 V. However, the output is increased to approx. 100W. The capacity of the electrical system is often reached in small vehicles simply be turning on the headlights. The lights will dim when the brake light is activated and no additional loads may be placed on the system. The NARAKU regulator can make up for those deficits by providing an improved power balance, without overcharging the battery.